Yes, we’re completely aware these Notepods are just a clever attempt to capitalize on the popularity of the iPhone and Moleskin notebooks, but we don’t care, we still want them. On one side you’ll find “52mm by 77mm of blank space floating in darkness… in a form reminiscent of a popular smart phone” (got to keep the Apple lawyers at bay I guess) and on the other, a light 6mm grid for technical sketches or tic-tac-toe. Like Field Notes, the Notepods are available in packs of 3, and even though they’re being sent from Australia, they’re just $17.95 shipped anywhere in the world. With all kinds of working place on carhartt coats all non-business and business apprehension, lab coat is used by professionals, technical staff and workers. 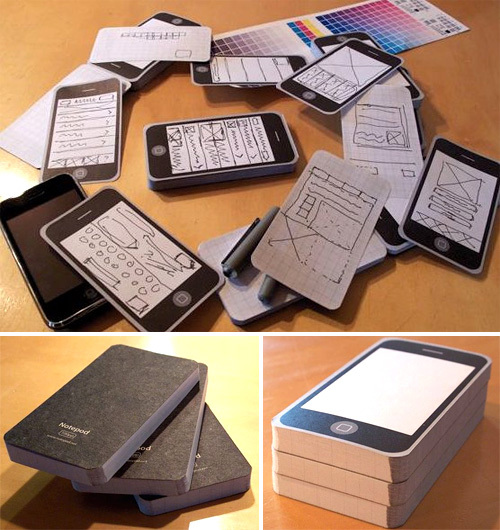 The object of this design is not post it's, its for designers who are designing iphone applications this is a physical template of the iphone to scale. You “AlWriteNow” are complete fail. where can I get these from the company seems to have disappeared?